This web page is to outline how a F100 steering box was modified and installed in my 1931 Victoria. I don't pretend to be an expert nor imply that this is the only way to go. I do hope that my experience may be of value if you decide to install a F100 steering box in your car. Make a template of the Model A steering box mounting flange and cut the F100 flange to conform. Drill and tap the flange for 3/8-24 UNF bolts (can't use thru bolts). 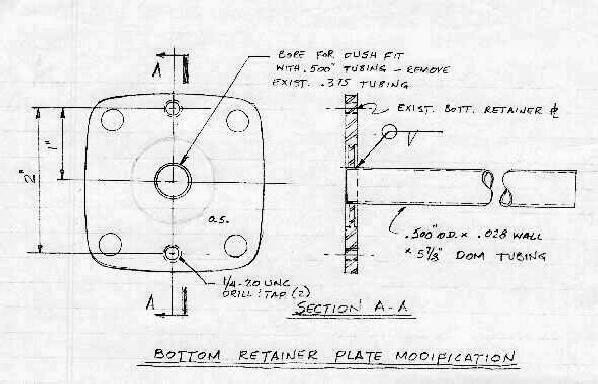 Modify F100 Bottom Retainer Plate per sketch. Bore Worm Shaft per sketch. Cut ears off of one Model A Steering Box End Plate. Install Light Switch Bracket and two (2) Steering Box End Plates to F100 Bottom Retainer Plate. End Plate without ears to be mounted next to F100 box to allow clearance for Light Switch Bail. Use sealer on threads to prevent leaks. Cut F100 Steering Shaft approximately 18" above box. Measure distance on Model A Steering Box from bottom of Steering Column to end of Steering Shaft threads. Cut Model A Steering Shaft so as to maintain the above dimension on the F100 Assembly. 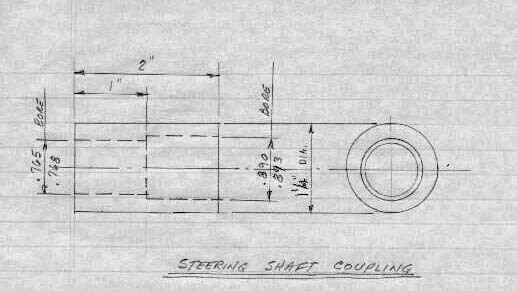 Use Coupling per following sketch and weld the F100 and "A" shafts together. Loosely attach steering wheel to insure that wheel is in the desired position at "center". Make Sleeve Adapter to allow the Model A Steering Column to connect to the F100 box. (No sketch available). If you use the "A" Pitman Arm you must modify the F100 output shaft accordingly. I opted to use the F100 Pitman Arm. 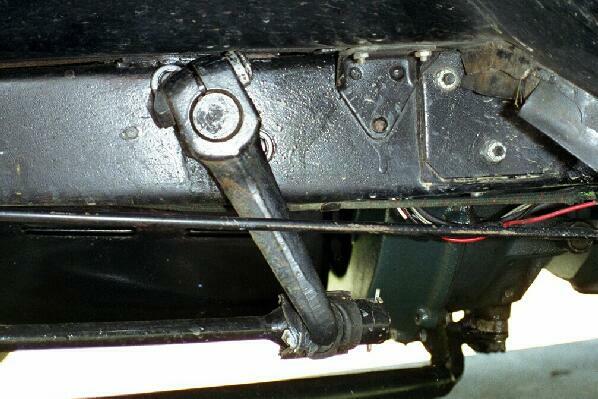 You must grind the corners of the F100 Pitman Arm for clearance with the fender. This includes the bolt head and nut. I cut the bolt shorter and used a thin locking nut. Even with the grinding I wound up putting a small rubber shim under the fender for additional clearance.